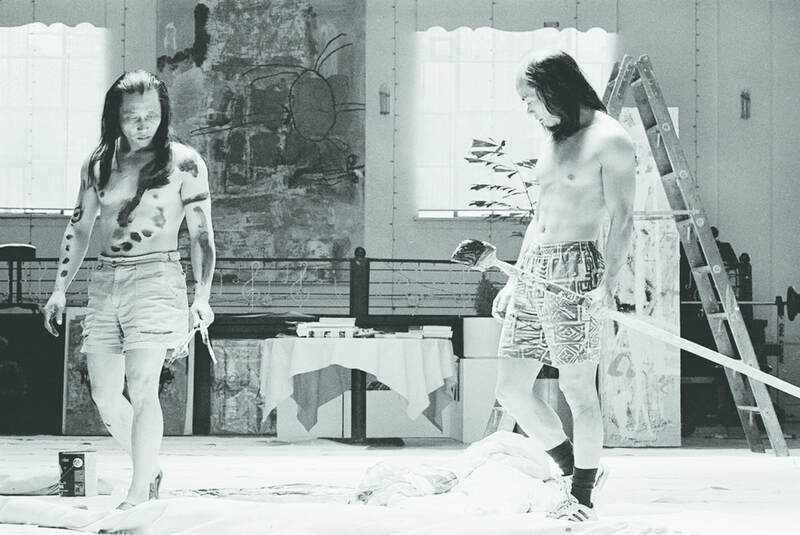 The Zhou Brothers are among the most legendary and established cultural figures in the contemporary art world. Originally from China, they have been residing in Chicago for the last thirty years. As artists, they live in a world of the self. 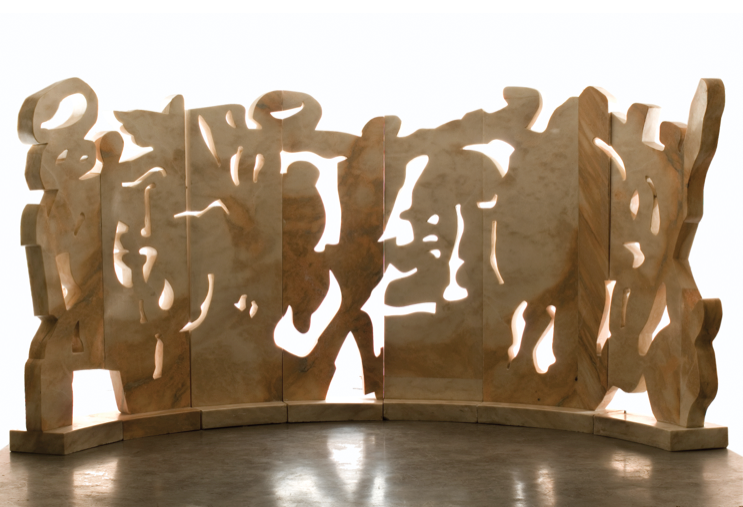 Their art is made to explore the topic through inquiry about humankind itself. Their life reflects their pursuit of art, which is a heroic journey to conquer the world. While enjoying a successful art career spanning decades, they also built a successful business based on their art practices. 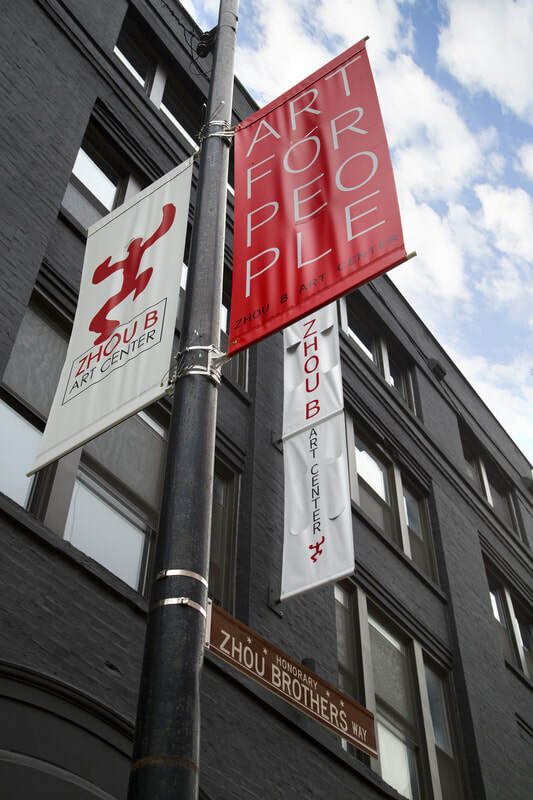 There is a big warehouse building located in the Chicago neighborhood of Bridgeport baring their names: “Zhou B Art Center”. 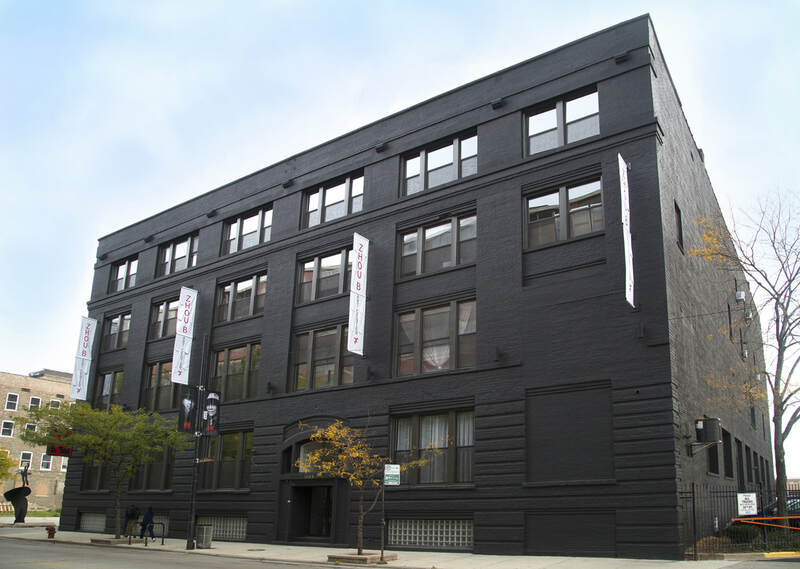 They bought the place twelve years ago and have gradually developed it into the most popular private art center in Chicago. In the meantime, they started their own art foundation and opened an artists residency exchange program. 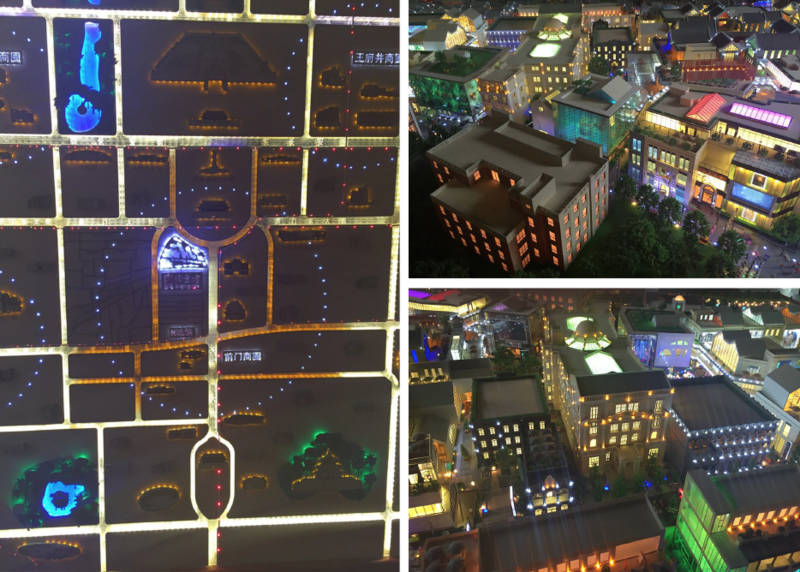 Recently they have been developing a new international Zhou B Art Center in the most popular downtown area of Beijing China. Zhou B Art Center, Chicago, IL. Honorary Zhou Brothers Way, Chicago, IL. 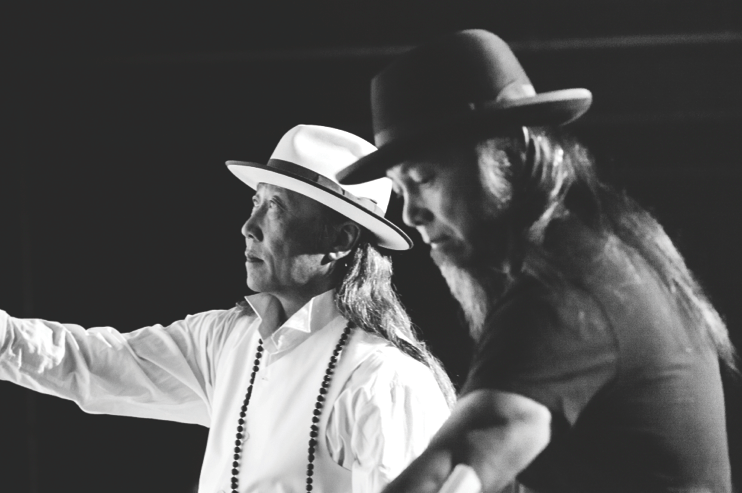 It is surprising to learn that the Zhou Brothers didn’t think of themselves as entrepreneurs or “Artreprenuer”, the trendiest label nowadays for artists, even though their business endeavor is a real case study of how to become a successful “Artreprenuer”. In the public eye, they are the prototypical artist, mysterious, eccentric, and not shy of enjoying what their successes have brought them. 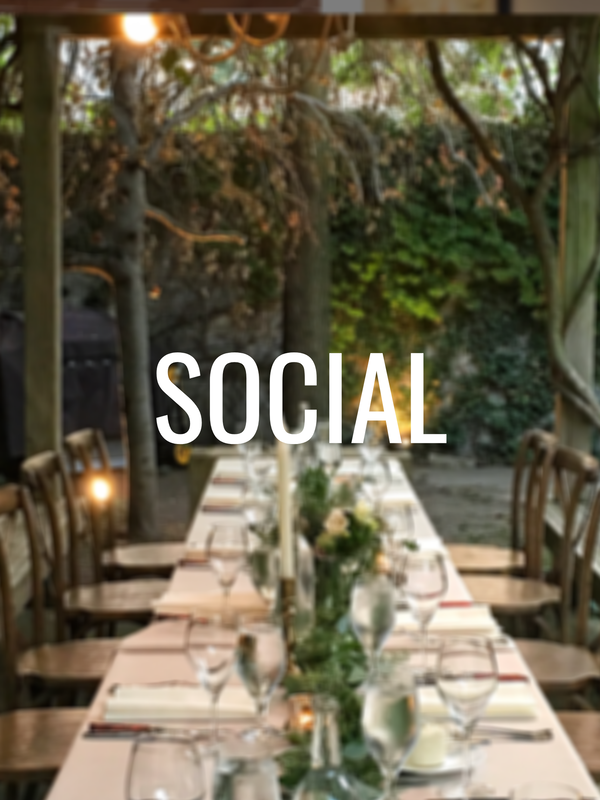 They are famous for their lavish galas at home where they rub elbows with tycoons, politicians, and celebrities. 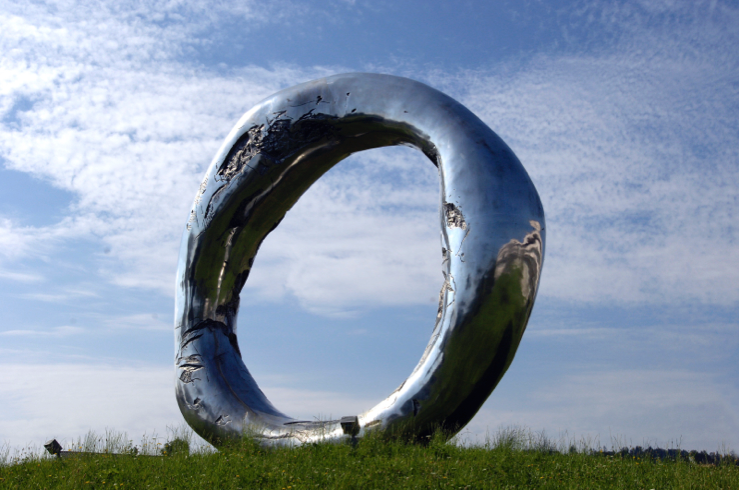 Their works are sold for millions to private collectors around the world. In the media, the Zhou Brothers name is always associated with wealth, fame, and big success. Zhou Brothers on the Silk Road, 1978. 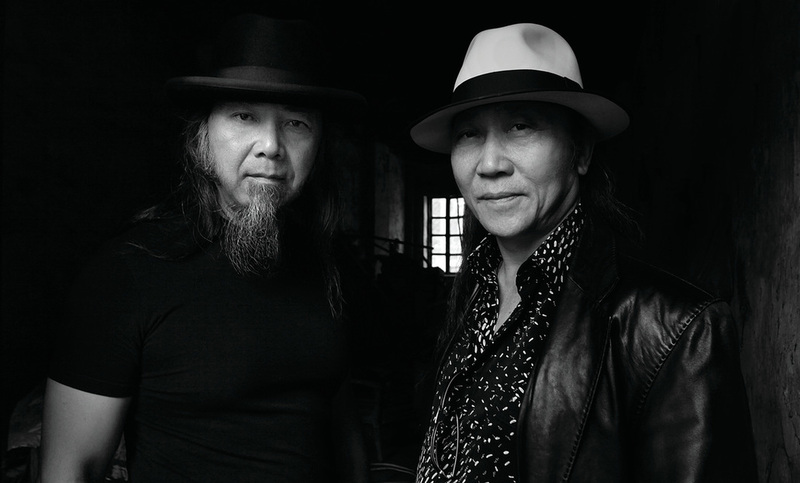 The Zhou Brothers, Zhoushi ShanZuo [周氏山作] and Zhoushi DaHuang [周氏大荒], were born into a well-educated family of the Zhuang ethnic minority in China’s western Guangxi province, in 1952 and 1957 respectively. Since their early childhood, they have shown talent in painting and drawing. However, the Cultural Revolution in China from 1966 to 1976 turned the lives of the Chinese elite class upside down, and the family of the Zhou Brothers were no exception. The brothers experienced unimaginable hardships in their teenage years. With wisdom beyond their years, they decided to look towards potential opportunities rather than wallow in self-pity. Such a spirit has never abandoned them, and to no surprise it is reflected in their paintings as well. The Song of Life, 1976. The Sea of Songs, 1976. With only $30 in their pockets but limitless ambitions, the Zhou Brothers gave up everything they just earned in China, and came to a new world to face an unknown destiny. Luckily their first show caught the attention of the Chicago art world, as the critic Margret Hawkins wrote in the Chicago Sun-Times, "... The whole thing is a pattern of ritual celebration that owes nothing to Renaissance perspective or the Western tendency toward narrative...” The style of the Zhou Brothers’ paintings not only fell in the context of gestural abstraction that was easily understood by Westerners, but also carried a mysterious atmosphere from the prehistoric civilization of ancient China. Commercial success followed. 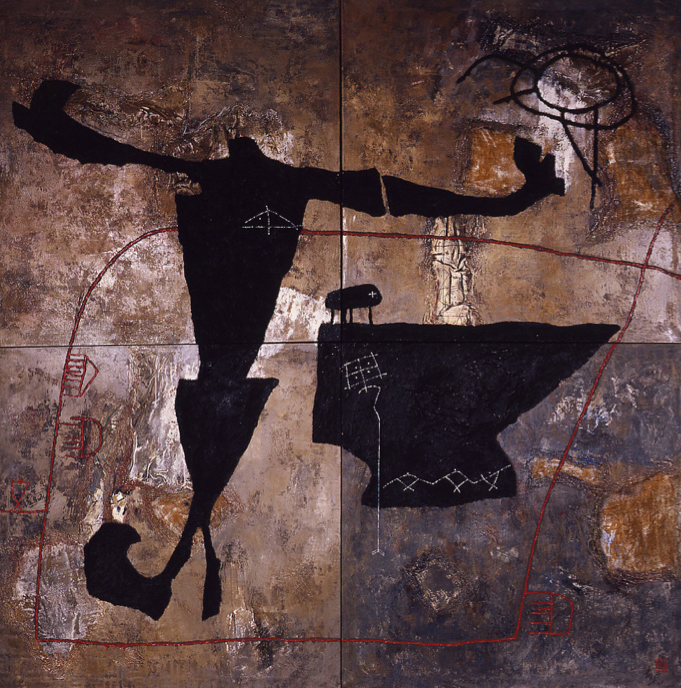 By 1990, they had already exhibited in prestigious galleries and museums all over the world. Performance at Navy Pier, Expo Chicago 1994. This attitude is derived from the ancient Chinese culture of the literati class, favoring self confidence as the Chinese aesthetic heroism. Exactly as to what the painting expressed, the one that we have done for the World Economic Forum in Davos Switzerland in 2000 we praise the bright positive side of human nature with open arms, embracing the new world bravely like a child." Live Painting at World Economic Forum in Davos Switzerland, 2000. In 2000, the Zhou Brothers were invited to paint live in the opening ceremony for the World Economic Forum in Davos Switzerland in front of the world’s politics and economics leaders. The painting was 10 feet high and 25 feet long, named “A New Beginning”, a dedication to the millennium. 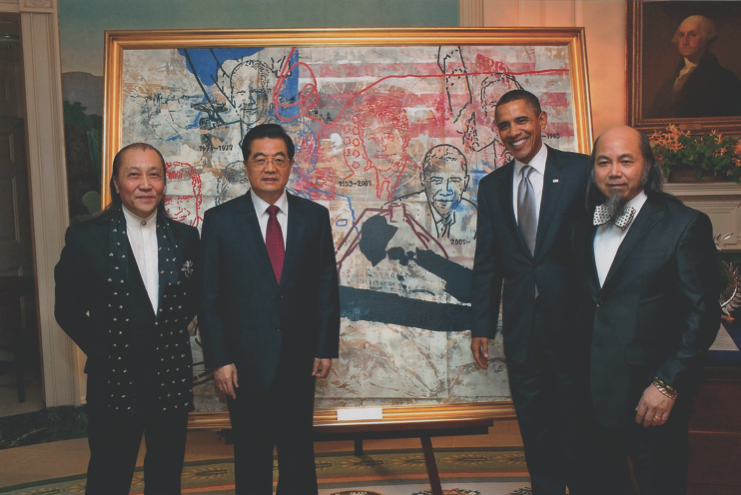 The Zhou Brothers present a painting from President Obama to the President of China Hu Jintao. Like all talented artists who keep departing from their signature styles and exploring new possibilities, the Zhou Brothers’ works has evolved considerably over the decades. Since the turn of the millennium, the Zhou Brothers’ paintings have become almost entirely abstract and free flowing. 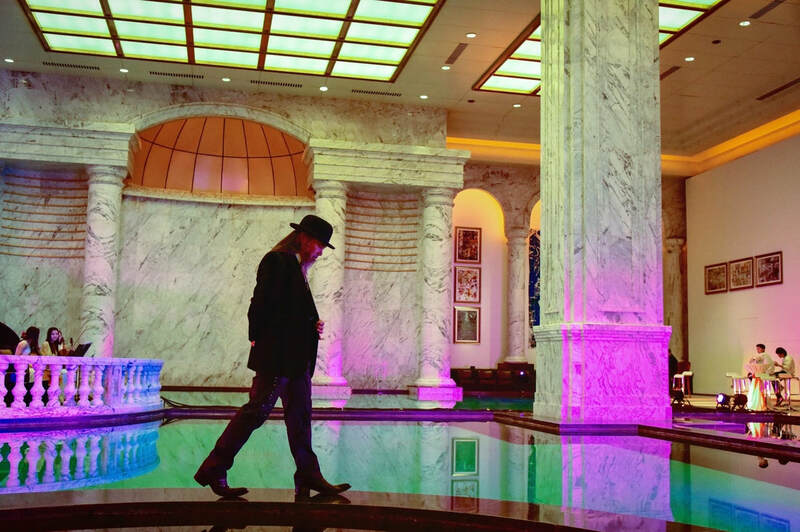 The color becomes brighter and richer. Most traces of narrative and figure have been eliminated. Texture is more important than ever. The paintings are more based on material and are process-driven, and are more concerned with a fluid movement than before—fluidity not only of physicality but also of emotion. Unlike their early paintings, when the struggles and fights were shown clearly on the canvas. The new works show a uniform, calm ornate style, with all movements hidden beneath the surface. As they say, they now seek more intangible sense of movement driven by an invisible flow. Entering the fourth decade of their collaboration, this may mark the successful maturation of their personal philosophy of “Feelingism”. From looking at the images, they have made choices in life and handed themselves a satisfactory answer sheet. The Water Lily Pond of Life, 2015. 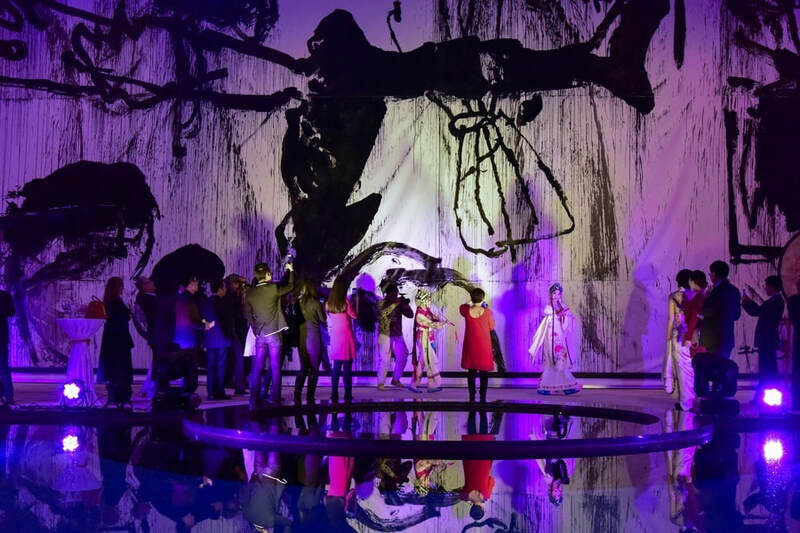 Their latest works, THE WATER LILY POND OF LIFE [生命的莲花池 is a new series in this direction, soon to be shown in China, following their last retrospective at the National Art Museum of China in 2007. From close observation, these two individuals have very different, almost opposite personalities that challenge and complement each other. At the same time, each of them carries an intriguing combination of the strategic mind of a businessman and the pure heart of an artist. During their painting process/live performance, the canvas becomes a battlefield to bare their fierce fights and struggles. It is amazing that each battle will reach a singular vision of stopping at the right moment, or yield a truce at the end. To watch the residues left on their canvas is to experience “道Tao”, which describes such scene as “道生一、一生二、二生三、三生萬物。萬物負陰而抱陽、沖氣以爲和” in ancient Chinese philosophy. [The Way produces one, one produces two. The two produce the three and the three produce all things. All things submit to yin and embrace yang. They soften their energy to achieve harmony. Commercial success and pure artistry are usually considered mutually exclusive. To them, however, it’s not a conflict. They just live their life with the same artistic feeling of making their paintings. They call their philosophy “Feelingism,” [感觉主义] and elaborate it as “feeling is liberty.” [感觉是自由神] It can be interpreted as going with your guts, blindly believing in yourself, and following your heart. As painters, they make decisions spontaneously based on their intuition in the moment. In that sense, they are just simply applying this “feeling” to other areas of their life practices, including business. Labels such as Artist or Entrepreneur are irrelevant to them. Before the secret of how human’s intuition works is unraveled, they can only be defined as geniuses in life. Opening of the Zhou Brothers Studio, Beijing, 2015. ZB: “Our Studio in Beijing is a natural result of our creative development. We want to share our work, our vision, and our philosophy that ‘Feeling is Liberty.’ "
In 2015, the Zhou Brothers opened a new studio in Beijing. Returning to the homeland they left four decades ago, this new studio will be their major site to live and work from now on. The astonishing interior of the new studio is once again the product of their wild imaginations. 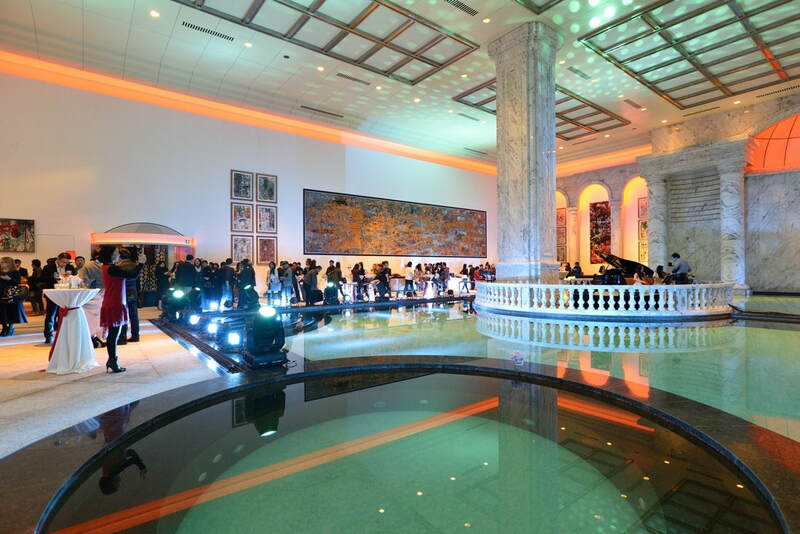 A year later, a new international Zhou B Art Center broke ground in the center of downtown Beijing. For people who know them, this new chapter in their legendary journey comes with no surprise. Plans for the new Zhou B Art Center Beijing. “Mystery within mystery; The door to all marvels, ” [玄之又玄、衆妙之門]" a quote from the Tao Te Ching by ancient Chinese philosopher Laozi, may be the best summary of this close observation.